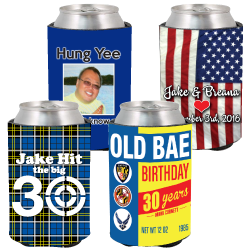 If you're looking for a koozie that has a fun and personalized flair, you'll love Personalized Drinkware's full color photo koozies. If you want to relax and enjoy a nice cold beer while at the same time gazing at a hilarious photograph from your recent vacation to Hawaii, these collapsible can holders are exactly what you need. They're terrific for reunions, weddings and all types of other memorable events in your life. You don't have to use an actual photograph to get a personalized koozie, either. Personalized Drinkware is also capable of printing these sleeves from colorful artwork. If someone drew a funny cartoon portrait of you, that might be a great way for you to label a koozie as being strictly "off-limits" to other people. 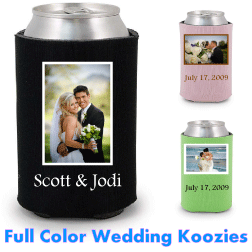 Many people also choose to print logos or text onto their photo koozies. If you share an apartment with roommates, it might be smart to put your name on your own koozie, for example. Consider handing out these can coolers at a major community event, such as a summer fair or festival. Attendees will use them as they drink soda, beer or juice during performances and competitions. People appreciate koozies because they prevent warm hands from heating up beverages. During winter events, they stop drinks from making fingers feel cold. Festival-goers bring the can holders home as well; this helps remind them to attend next year's event. Promotional koozies come in handy when you want to advertise any business or charitable organization. This effective marketing tool lasts much longer than a newspaper ad. We could print your company's logo on the can holder and include a photo of your business or product. Consider giving it away as a free bonus for anyone who purchases an item. A well-made promotional product may remind a customer's friends and family about your establishment for years to come. Be sure to learn about our bulk discounts. You can save up to 79 percent by ordering photo koozies in large quantities. Keep in mind that we offer free setup and shipping. This makes it easy to calculate the total cost without contacting us or entering personal information. If you prefer a more economical option without photos, see our premium neoprene can coolers. You may choose a color and add text or a logo to the design. 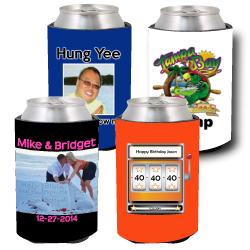 Many people know exactly what they want on their photo koozies prior to placing their orders. Some people are a little more uncertain, however. If you want a full color koozie but aren't 100 percent sure how you want it to look, don't worry. Just talk to the pros at Personalized Drinkware. The Personalized Drinkware team can provide you with the in-depth design assistance you need -- and for absolutely no extra charge at all. Customers can select their own desired font and background colors. Not only do orders of these koozies come with those exciting perks, but they also come with low minimums. Setup fees are totally unnecessary for purchases of these can holders. eMail us your custom artwork. Your photo on a koozie! Prices include a four-color process sublimation imprint. Free second side & bottom imprint.